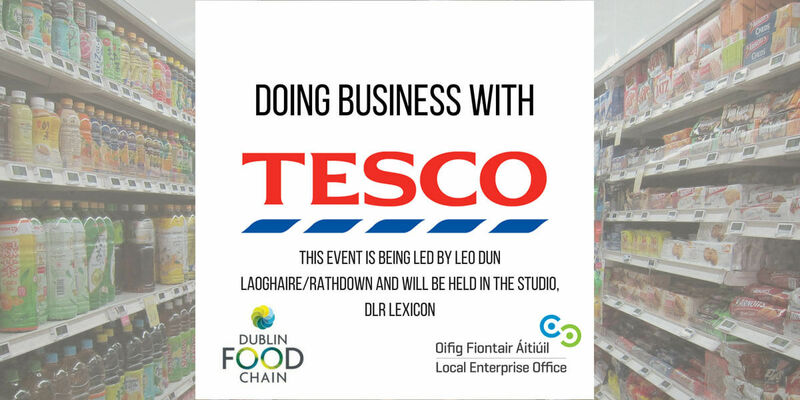 Continuing with the Dublin Food Chain theme of understanding the retail market place, this unique event will provide participants with the opportunity to meet with the team from Tesco Ireland and understand more about succeeding with listings and ongoing business. This event is being led by LEO Dun Laoghaire/Rathdown and will be held in The Studio, DLR Lexicon. This event is open to food producers, food distributors and those thinking about starting a food business who wish to learn more about supplying Tesco. While this is not a formal producer showcase, a number of the Tesco buyers have expressed a willingness to look at product samples. If you intend to taste product, you must use a branded tasting stand and book a slot barbara@jamesburke.ie (max 8 tasting slots). This is simply a meet and greet opportunity with no guarantees of a listing.